The Benefits of Baby Sign Language? When babies are born, their brains contain 100 to 200 billion brain cells but what they do not have is the connections between these cells. As signing allows babies to practice using a form of language early on, they are able to make more of these connections by establishing relationships between objects and activities, spoken words and signs at an early age. Helps improve intellectual development, resulting in higher IQs. As a follow-up to the original study, Acredolo and Goodwyn assessed the IQ of the study group participants when they were eight years old. They found that those who had signed as babies had an average IQ of 114 which was 12 points higher than the non-signing children. Think about it: signing encourages you to talk more to your baby than you normally would, as words and signs are always used together. Through signing, you and your baby will tend to notice more things to sign about. The more signs you use, the more they will get repeated, providing your baby with more opportunities to hear how words sound. And, as babies request or use a sign, you will naturally talk and provide them with more information. What fertile training ground for early speech! Reduces tantrums, tears and frustration. Babies who sign are less frustrated because they are able to communicate their needs, wants and emotions. Babies discover early that signing is far more productive than tear or tantrums! Develops larger vocabularies & understand more words. Signing gives babies' options: either to use a sign or say a word. 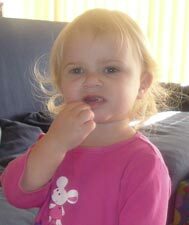 At 14 months, my daughter Ellie had 35 words in her vocabulary, 25 signs and 10 proper words she used to 'talk' to us. She didn't have to wait until she can say the word to be able to communicate. On average, by the age of two, baby signers have 50 more spoken words in their vocabularies than non-signers. At age three, research has shown that these little signers are saying and understanding words equivalent to that of most 4 year olds. Increases communication and learning at a very early age. Baby signers are able to participate in the communication process to 'talk' about their wants, needs, feelings and interests, long before they can utter a word. They are more observant and watch to see what new things they can learn. They also learn early to request new information by pointing to things... and the more they learn, the more they want. Through signing, they can ask questions and receive answers. Encourages greater interest in books and pretend play at an early age. Signing allows babies to interact and 'read' books with you, and to extend their pretend play. As they develop their communication skills, you may notice they tend to incorporate signing into their everyday play e.g. signing to their toys. Enriches bond with parents, siblings and caregivers. You spend more quality time in two-way communication when you sign. Babies become a more active member of the family, as they are able to participate in the communication process. Babies who learn to sign tend to develop a 'can-do' attitude as they are able to tell you what they want, when they want it and be understood. Signing babies have more control over their world which helps to develop confidence and self-esteem. Reveals how smart babies really are and gives you a window into their mind. Because babies can't talk, we often fail to appreciate how much they really understand. Signing allows your baby to express their intellect at a very early age. You'll be amazed at what goes through a baby's mind and through signing, your baby will be able to tell you much of it. Remember, everything is new to them and they want to tell you what they discover.